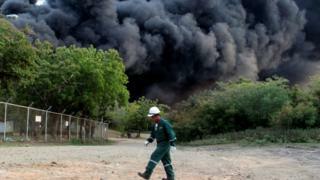 Fire fighters in Nicaragua are trying to bring under control a huge fire at the country's only oil refinery. The blaze started two days ago when one of four big fuel tanks exploded at the Puma Energy facility in the Pacific port of Puerto Sandino. A second tank caught fire on Thursday. No casualties have been reported but the authorities have warned residents to avoid the clouds of smoke full of noxious gases which have been billowing thousands of metres into the air. Shelters have been prepared in case the wind changes direction away from the ocean and towards the land. Experts from the US and Canada are in the country to advise officials on how to bring the fire under control. Puma Energy said it was working to contain the situation and emphasised that safety for local residents was a priority.